SOLVED: What is the Difference Between the Seagate BaraCuda Pro and IronWolf Pro & Why is IronWolf Cheaper? For the last few days we have been banging around the idea of large 14TB disks and we wanted to source the fastest, most reliable, least expensive disks possible. 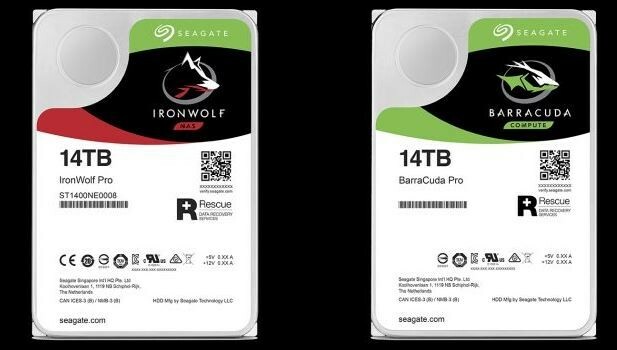 We know the Seagate BaraCuda is targeted to desktops / workstations and the Seagate IronWolf is targeted at disk arrays, wanted to know the physical difference between these two. olf 14TB to be about 10% less expensive than the BaraCuda 14TB which did not make much sense to us so we decided to check the detailed spec. Unfortunately Seagate apparently does not want you to make comparisons between the disks because they use slightly different specification sheets for each one. To get around this we spent an hour or so combining the two sheets into the spec’s you see below. You can see that the BaraCuda 12TB and 14TB disks now have the same performance (transfer speed and latency) while on the older 10TB and 8TB models there is a tiny difference. The IronWolf is cheaper (at least in April 2019 – see screen shot of Amazon prices to the right). If you want to check the specifications yourself, click HERE for the BaraCuda Pro spec sheet brochure and HERE for the IronWolf Pro spec sheet brochure.